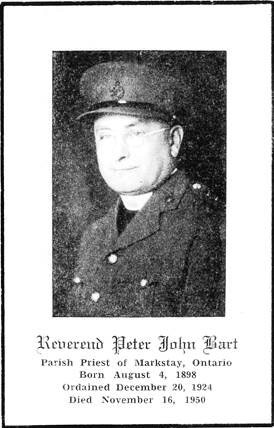 Bart, Peter John, priest, member of the Congregation 1917-35, was born in Stratford, Ontario (diocese of London), on 4 August 1897, the son of Peter Bart and Caroline La Porte. 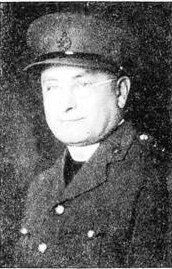 He died in Toronto on 16 November 1950, and is buried in the Basilian plot of Assumption Cemetery, Windsor. 1923. During these years he excelled on the college football team. 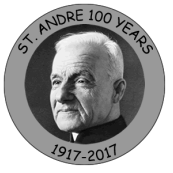 He did theological studies at St Basil’s Seminary, Toronto, and was ordained priest on 20 December 1924 in the chapel of St Augustine’s Seminary by Bishop John McNally. College, Toronto, in 1932. He was a philosopher, and read papers at a number of professional conferences. was buried with the Basilian community.